1 Person Dies After Southwest Jet With Blown Engine Makes Emergency Landing : The Two-Way Seven other people were treated for injuries when the flight from New York, bound for Dallas, was forced to land in Philadelphia. Federal investigators say a fan blade separated from the engine. The engine on a Southwest Airlines plane is inspected as it sits on the runway at the Philadelphia International Airport after making an emergency landing there on Tuesday. 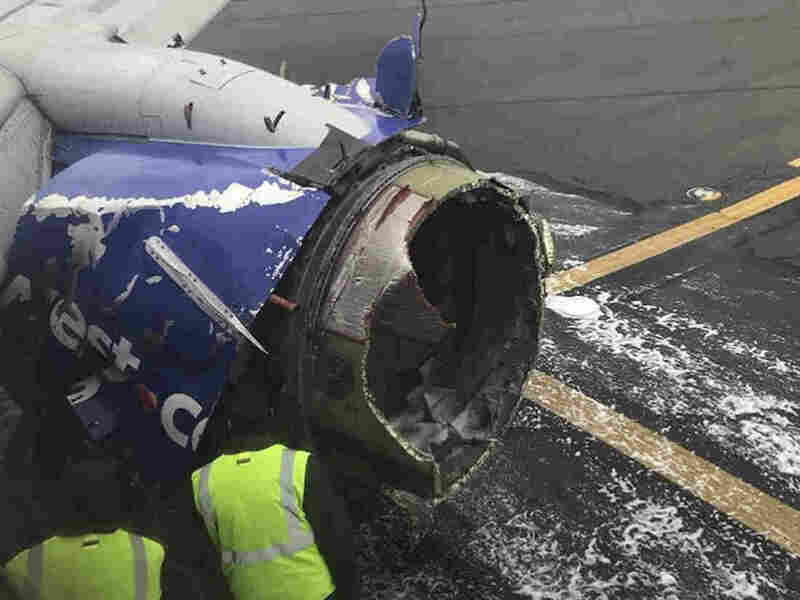 National Transportation Safety Board Chairman Robert Sumwalt said an initial inspection showed that a fan blade had separated from the engine. In a news conference late Tuesday, he said the plane's engine has twenty-four blades. "The number thirteen fan blade was separated and missing and it was separated at the point of where it would come into the hub," he said. "Our preliminary examination of this was that there's evidence of metal fatigue where the blade separated." Sumwalt added that the engine's cowling was found on the ground about 70 miles northwest of Philadelphia. Investigators won't complete their determination of the cause for several months. "We do have information that there was one fatality," Sumwalt told reporters during a news conference earlier in the day. Philadelphia Fire Department Commissioner Adam Thiel had previously told reporters that one person was transported to a hospital in critical condition and that the seven others were treated at the scene for minor injuries. In a news conference in Dallas, Southwest Airlines CEO Gary Kelly said the twin-engine 737 had just been inspected on Sunday. He said the deceased passenger is Southwest's first in-flight fatality. The NTSB's Sumwalt said that Kelly promised that the entire fleet at Southwest will receive an "ultra-sonic inspection." According to the Associated Press and other news reports, passengers said that shrapnel from the failed engine smashed a window and the resulting cabin decompression pulled a female passenger partially out of the plane. "Another passenger, Eric Zilbert, an administrator with the California Education Department, said: 'From her waist above, she was outside of the plane.'" The woman received CPR from flight attendants and other passengers, as well as electric current from a defibrillator, according to the New York Times. Southwest and other authorities have not released the name of the deceased passenger. But she was identified by New Mexico Gov. Susana Martinez as Jennifer Riordan, a Wells Fargo Bank executive, according to the Associated Press. "The entire Southwest Airlines Family is devastated and extends its deepest, heartfelt sympathy to the Customers, employees, family members and loved ones affected by this tragic event," the airline said in a statement. The plane made the emergency landing "after the crew reported damage to one of the aircraft's engines, as well as the fuselage and at least one window," according to the Federal Aviation Administration. Crew members alerted air traffic controllers that there were injured passengers. "Could you have medical meet us on the runway as well, we've got injured passengers," said a crew member in audio posted on LiveATC.net. "Injured passengers, OK, and is your airplane physically on fire?" asks the air controller. "No, it's not on fire, but part of it's missing," she responds. "They said there's a hole and someone went out," she added. Photos taken by passengers on Flight 1380 and others showed that one of the plane's windows was blown out and parts of an engine were ripped off. "Something is wrong with our plane! It appears we are going down!" passenger Marty Martinez said in a livestream video as he breathed through an oxygen mask. He said on Facebook that an explosion outside the window injured a woman sitting next to it. Passenger Kristopher Johnson told CNN, "All of a sudden we just heard this loud bang rattling and then felt like one of the engines went out, the oxygen masks dropped. "We just got the mask on, and as soon as we landed we were thankful. The pilots did a great job, the crew did a great job, got us down in Philly." Sumwalt, the NTSB chairman, said that the federal agency is deploying a "go team" to conduct an "extensive investigation." He says that the flight recorders have been secured from the plane, and the investigators expect to receive a preliminary readout this evening. The engine will be shipped off-site for inspection, he said. Contrary to earlier reports, Sumwalt said there was no indication of an engine fire. He noted that the separation of the fan blade could have triggered alarms in the cockpit. The flight tracker FlightAware shows that the plane took off from New York's LaGuardia Airport at 10:27 a.m. ET, then suddenly turned sharply toward Philadelphia, where it landed at 11:23 a.m.
Southwest is known for its strong safety record. According to The Points Guy, an industry analyst, the airline has been involved in one previous incident that resulted in a death on the ground, when a Southwest plane struck three cars in Chicago as it slid off a runway.